3 Garnets & 2 Sapphires: Ultimate Holiday Tech Gift: NEW D-Link Full HD Ultra-Wide View Wi-Fi Camera (DCS-2630L) w/ 2-Way Audio! Ultimate Holiday Tech Gift: NEW D-Link Full HD Ultra-Wide View Wi-Fi Camera (DCS-2630L) w/ 2-Way Audio! Thank you to D-Link for providing a Full HD Ultra-Wide View Wi-Fi Camera (DCS-2630L) unit for this holiday tech gift review. All opinions expressed are our own. We have been using D-Link wireless cameras for years in our home. We use them to watch the house when we aren't home, watch the kids, and even keep an eye on the dogs to make sure they are behaving. Wireless cameras are not just a convenience in our household at this point, but an important necessity. 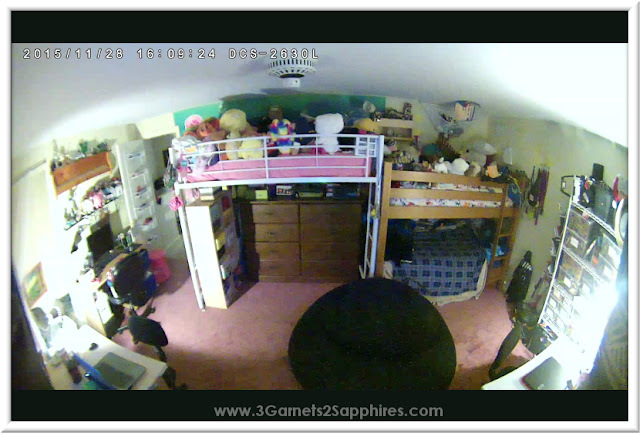 We have been using various fixed position cameras as well as a motorized camera we can control remotely. Both kinds have their pros and cons and are used differently in our home. The fixed position cameras are perfect for watching entry ways and where the dogs eat and drink water. 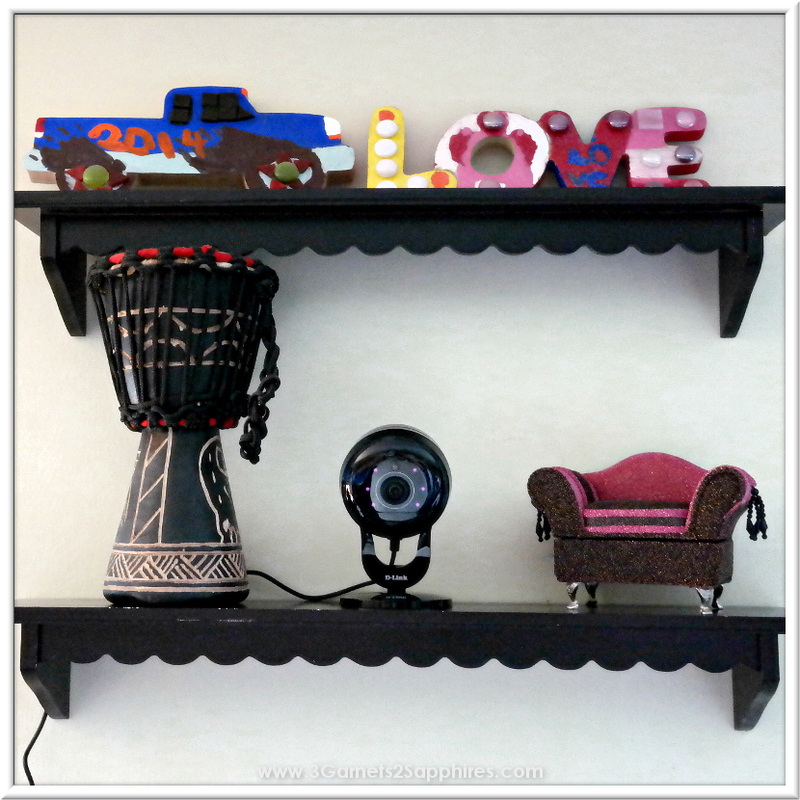 The motorized camera is perfect for the livingroom area where we need to pan around to see everything. Both types have their shortcomings, however. Fixed cameras of course can only see what they are pointed at and the remote camera is slow and noisy. If you needed to track something in a hurry the motorized camera is inadequate. The noise also changes the behavior of the dogs so I can't catch them in the act of shenanigans! This brings me to a new product by D-Link that solves the shortcomings of both camera types and adds new features we didn't have before. 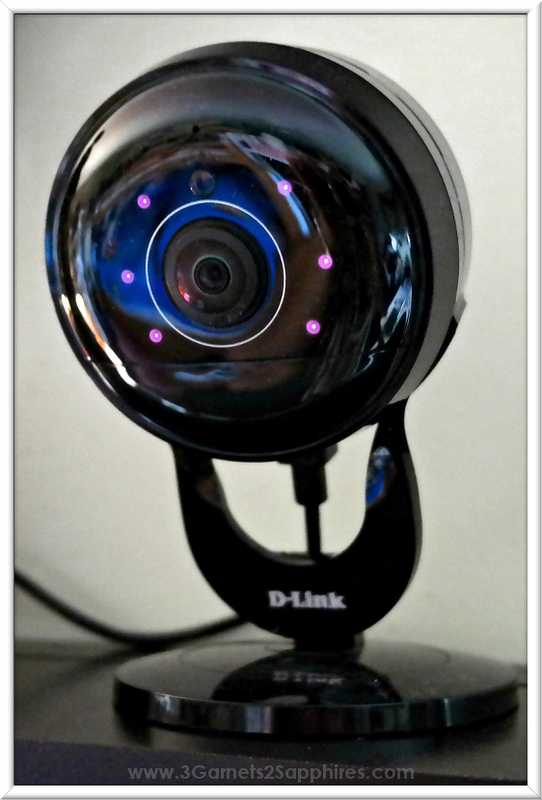 The new D-Link Full HD Ultra-Wide Wi-Fi Camera (DCS-2630L) is a fixed position camera, but features a 180 degree lens. Wide angle or fisheye lenses aren't new, but the 2630L uses D-Link’s new ‘Wide Eye’ technology offering an ultra wide view that's not distorted or curved like others. It’s like a panoramic picture but its live 1080P video. Like most D-Link cameras, the 2630L can be managed from the mydlink website from any computer or mobile device, making it simple to check in on your home while you're out. Setting up the camera was a little laborious and really shouldn't have been. The camera uses WPS (Wi-Fi Protected Set-up) for easy pairing, like many devices do, but still took me a few attempts to get it to pair. 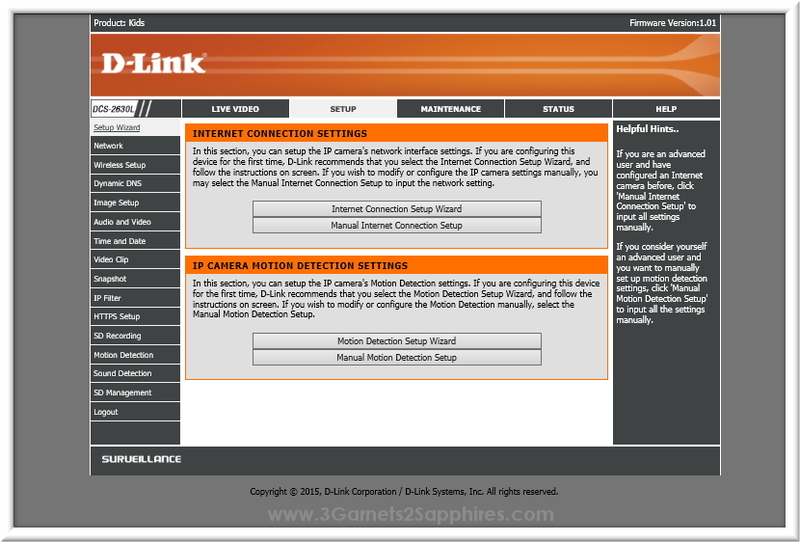 The camera can only be paired wirelessly as it does not have an ethernet port like other D-Link cameras. Although I was ultimately successful, I imagine some will need to call for assistance at some point. Once paired, configuration was as easy as can be and similar to my other cameras. 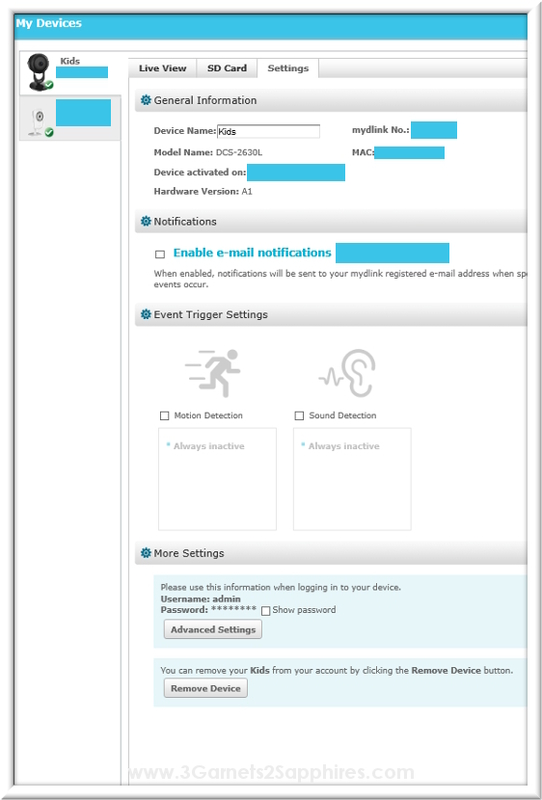 If you are familiar with the mydlink site you will not have any issues renaming the camera and changing any other settings to your liking. You can also choose to get into the advanced settings page where you can really customize your camera. I caution, however, that these settings are for people who have a better than basic understanding of network protocols and such. The D-Link 2630L looks great and does not stand out in the room. Many wireless cameras aren't good looking at all and are an eyesore, but not the 2630L. The construction is sturdy and it has a weighted base to make sure it stays put. You can optionally mount the camera if you would like with the provided hardware. The large lens is also glass, not plastic, like so many others, adding to the overall sense of quality. One feature the 2630L has that none of my previous cameras has is two way audio. Before I could just listen, but with the new camera I can actually talk through the camera and have a conversation! This feature also works through the mobile app so you can view and talk from anywhere. My kids can no longer pretend they can't hear me when its chore time. The D-link DCS-2630L is fully 1080p in resolution (and can lower to 720p if you choose) and the imagery looks very good. I notice the video is a bit sharper in low light (black and white) than it is in color, but both are bright and sharp. The Wide Eye technology truly works, you can see from the screenshots that there is very little to no distortion at all, even while zoomed in. The 2630L also includes a microSD slot that adds storage to the camera allowing recording of video. Depending on the size of the card you use, you can store as much video as you please. For example, 7 days of 1080p video only requires 104GB. The camera can take as much as a 128GB microSD card. This is an excellent feature if you're worried about home security, nannies, cleaners, contractors, etc. The camera can also be set to trigger email alerts based on motion or sound. Overall the D-Link 2630L is a fine camera that’s packed with features. I still prefer a simple fixed camera for a hallway or pointed at some pet food dishes, but the 2630L is far superior to my motorized camera for larger areas. The ability to see the entire room at the same time without panning simply can't be matched. The additional features like the two way audio and the ability to record for days and days are just icing on the cake. At $199.99 the 2630L is in the same price range as many competing motorized panning cameras, making it a no brainer. It’s great looking, high quality, and the performance is great. The fact that I had to toil a bit to get it set up doesn't change my opinion of this product at all. The performance of the 2630L makes up for the hassle and then some. The D-Link 2360L would make a great gift this holiday for just about any household. Its great for any family that travels, has kids, pets, looks after seniors, or anyone that values an extra bit of security. The D-Link Full HD 180-Degree Wi-fi Camera is available for purchase at Best Buy and us.dlink.com. Who would the D-Link 2630L make the perfect gift for? Tell us in a comment here!